As we’ve been conditioned—whether in our education growing up or later in our careers—we take a problem, orient ourselves to it, make a plan, and then put our shoulders to the wheel to execute it. In design, however, we may withhold from defining the problem until we’ve immersed ourselves in understanding the space. Very importantly, we happily go backward or enter the challenge at different phases. Designers constantly venture into the unknown, and for many, that’s an uncomfortable place. Holding steady within these moments of uncertainty helps us to stay in a place of exploration so we can allow for new thinking and connections to emerge. 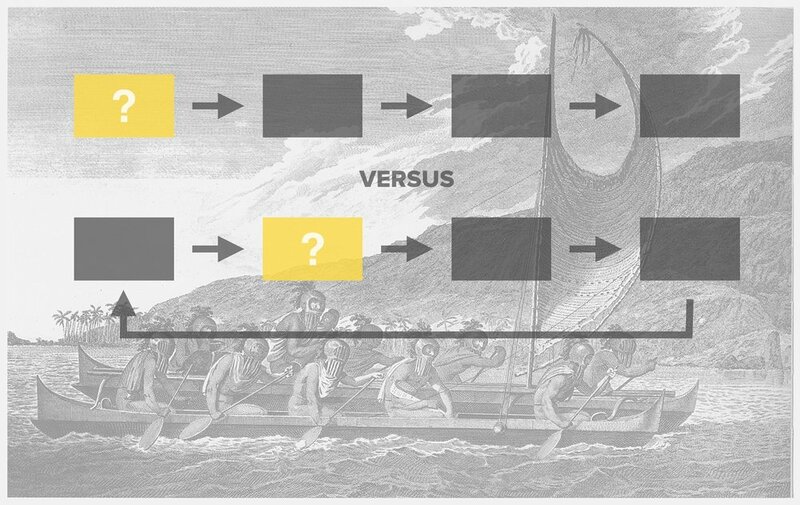 Whether it’s in discovering, defining, ideating, prototyping, or just simply working with others, Practicing Ambiguity keeps us from shortcutting creativity. Social anthropologist, Tim Ingold, draws upon the example of Micronesian travelers wayfaring through their environment. For thousands of years, they navigated the Pacific Ocean from Samoan to Hawaiian islands to New Zealand without the use of maps. Rather than following a plan from point A to point B, they continuously steered their course responding to the climate, stars, and terrain. This example highlights the importance of being attuned or present when dealing with changing conditions, whether it’s the weather, or a collaborative project with an unclear outcome. In Practicing Ambiguity, we present the idea that ambiguity isn’t necessarily a bad thing. The idea is not to just tolerate ambiguous moments, but to embrace them. 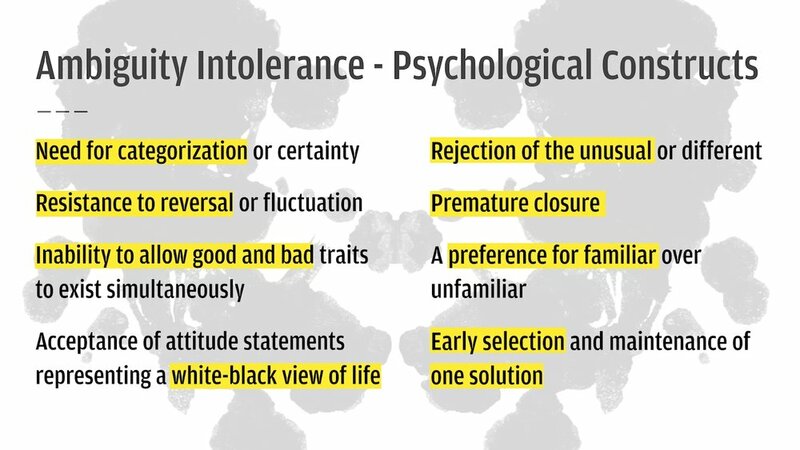 For example, one strategy we teach is to develop an awareness of ambiguity intolerances, as researched by psychologist Dr. Stephen Bochner. How do these manifest? Often, we see ambiguity as something getting in the way of our objectives. In these moments, we might feel confused or unproductive. We hear words like the team is lost or divided. With this view, the natural reaction is to remove the ambiguity, rush ahead, or jump back. In embracing ambiguity, we shift away from avoidance to see it as something we can dip in and out of. That intentionality opens the opportunity to leverage ambiguity when useful. As I’ve seen in my own practice and in the teams I have coached, when people become aware that ambiguity isn’t something to reject, but actually something to intentionally adopt; and aware of the ways ambiguity intolerance manifests itself in individuals and teams; it opens them up and adds to their value as collaborators. A snapshot featuring Practicing Ambiguity, as part of The Design Muscles booklets, designed and created in collaboration with my fellow Fellows, Hannah Jones and Andrea Small. Fuller offered this metaphor in an interview when asked about the daunting challenge it is for a lowly individual to affect his own life and even society at large. A trim tab is a tiny mechanism found on the end of a ship’s rudder. Moving the trim tab kicks the rudder into action, and thereby moves the entire ship. His metaphor speaks to the idea that even a small shift can create a bigger, more powerful one. Metaphors—including analogies, similes, etc.—are often employed in storytelling, but in Practicing Metaphor, I focus on leveraging metaphorical thinking for synthesis. Similar to how designers employ visual frameworks, metaphors can also serve as a tool for understanding, expanding, and expressing our ideas. Similar to a strong design insight, an apt metaphor captures something essential while also suggesting a direction to go. As highlighted above in Practicing Ambiguity, creative and collaborative work takes us well into the unknown. We go there intentionally, and there, a metaphor can serve as a space for collaboration. In other words, you can’t always talk about the thing, because you don’t know what the thing is...yet, but you can collaborate by proxy with a metaphor. For example, designers often look to analogous situations to shed light on the subject of their interest. I designed methods, such as these Metaphors Playing Cards, for learning the power of metaphor and employing it to work through real world challenges. In the inset below, I give an example of applying metaphorical thinking in my work. 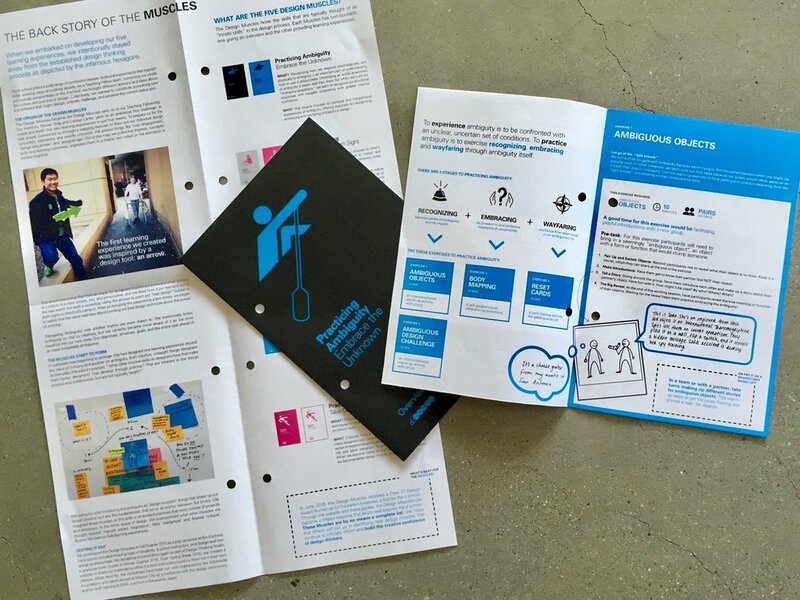 One of my favorite and most challenging projects looked at how to better civic engagement. Given the inherent complexity of civic life—with its interrelated systems, complicated relationships, and various influencers—this project was especially challenging. Tools and practices like visual frameworks, journey maps, mind maps, and storyboarding helped us tremendously in working through our findings, but they would feel either too narrow or too blunt with respect to the ecosystem. While we understood the nuance, we were stuck in defining our point of view so that we could move forward as a team or bring others in on the collaboration. Developing a metaphor greatly advanced our work. I found that what helped us was not only the final metaphor we landed on, but the exercise itself of working to find it. Creating many of them and testing each one, pushed us to consider the players, the context, and relationships through various lenses. In the end, the metaphor grew our understanding, gave us inspiration for what to create, and allowed others to understand the challenge in a way in which they could collaborate with us.